Walsh's campaign manager since April, Nick Provenzano is a former McHenry County Board member who served as secretary of the McHenry County Republican Party and has worked on more than 25 campaigns, including former 8th District Congressional Republican candidate David McSweeney's. On Oct. 21, a pair of McHenry police officers rolled down a dead-end McHenry street and found an SUV with its headlights turned off, according to a police report. Inside, they found a shirtless man and a 17-year-old boy. The man in the driver's seat was Provenzano, according to the report. They had met on Grindr, a popular gay dating app, the 17-year-old told police. 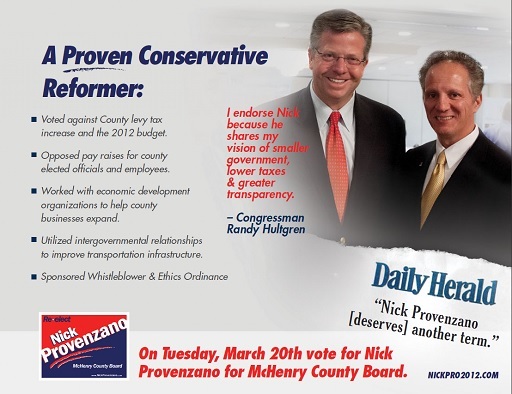 This week, Randy Hultgren sacked Nick Provenzano. One observer was fit to be tied, saying the discharge was premature: "This amounts to naked hypocrisy, to can someone for observing a core principle of the Republican Party -- trickle down economics!"